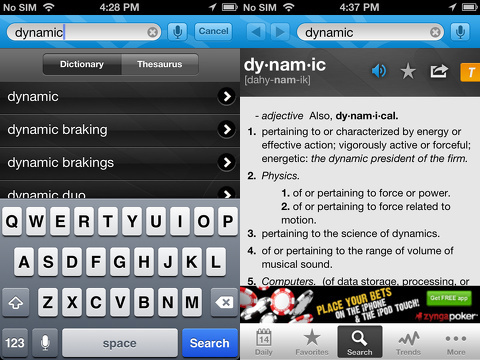 Dictionary.com is a free iPhone & iPod Touch app made by (you guessed it!) Dictionary.com LLC. Merriam, Webster, and Oxford have all had their heyday, but in today’s internet generation Dictionary.com rules supreme. Dictionary.com offers a fully functioning dictionary and thesaurus. You can look up words even without an internet connection. There is a favorite words option which offers a good way to have a list of words to be able to return to, great for the adamant linguists looking to get serious about expanding their vocabulary. There is an option for audio pronunciations so you don’t make a fool of yourself mispronouncing the word you just learned. Dictionary.com also comes with a complete thesaurus, and a shake for random word function which I’m not sure if I’ll ever really use. Perhaps for when you kind of feel like learning something but are also simultaneously bored and lazy? I’m not really sure. Lastly, there is a popular searches list which shows trending words which have been recently searched in the database. The fact that there are trending words at all is news to me. Dictionary.com utilizes voice recognition to conduct voice searches, a service which you can try for free but will then cost you 0.99 per 100 searches. Naturally, I decided to test the accuracy of this function with the longest word I know: antidisestablishmentarianism. You can go ahead and count how many letters that is, I’m just going to estimate it at around a thousand. The app only made the small mistake of interpreting the word as “anti-disestablishmentarianism,” but the true unhyphenated version was the first suggested result, so I’ll chalk that up as a win for Dictionary. Fallen behind on your daily updates? got some extra down time now?? Want to know yesterday’s word of the day? Me too. Can’t look it up on my app though. That would have been a swell and easy to implement idea wouldn’t it? Can you tell I’m bothered by that, or should I bust out some caps lock? I better not. It’s late, I’m tired, and caps lock takes a lot out of you. For now let’s try to keep things classy around here. We are still dealing with a good app, after all. The Dictionary.com app is a great dictionary app that will serve all your linguaphillic needs. It is available for free in the iTunes App Store. 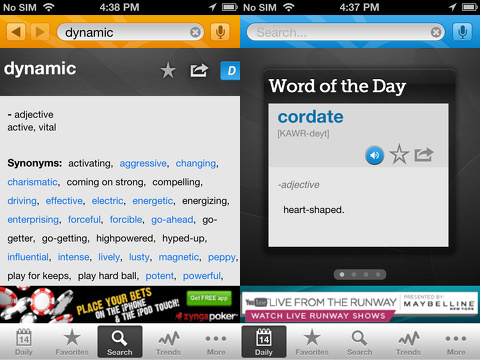 AppSafari review of Dictionary.com – Dictionary & Thesaurus – Free was written by Neema Akhtar on September 24th, 2012 and categorized under App Store, Free, Productivity, Reference. Page viewed 3793 times, 1 so far today. Need help on using these apps? Please read the Help Page.